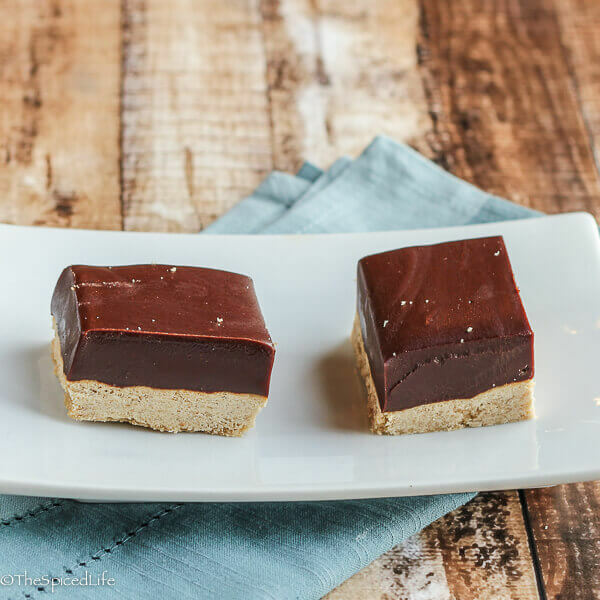 These Chocolate Caramel Shortbread Bars are an indulgent, decadent treat, perfect for this month’s Creative Cookie Exchange theme of Caramel. Keep reading to check out all of the wonderful caramel cookies we have this month! Affiliate links have been used in this post to link to items I am discussing. Guys I am just a bundle of nerves right now, writing this. As I write, we leave the next day–although as you read, there is a decent chance I am on a plane…. maybe even over the Atlantic! When I picked up the kids today from their last day of school, Sammy was visibly sad. I think leaving school early, just as it turns into the big party that the last 2 weeks are, was hard on both of my kids. Alex at least plans to text (over the internet) most of her friends. All of us fret about leaving the dogs for so long. There will be a house/pet sitter staying with them most nights, and the regular pet sitters coming on the days she cannot. They will be ok I know but a control freak hates leaving behind stuff out of her control! And I am nothing if not a control freak. I know, cry me a river. Truly I am mostly excited, but a worrier’s gotta worry! Anyway! About these bars. I made the majority of them for Staff Appreciation Day at the kids’ school, although as rich as they are I probably sent in too many. Which is not to say that they are not good–my kids in particular loved them. I thought we might peter out on eating them, because of that richness, but Alex and Sammy made sure every last crumb was devoured. The recipe for these bars comes from Carole Bloom’s Caramel , a treasure trove of recipes for those of you inclined toward anything caramelized. My only real change was to add Maldon Sea Salt Flakes to the finished bars, which I think keeps the bars from being too cloyingly sweet. 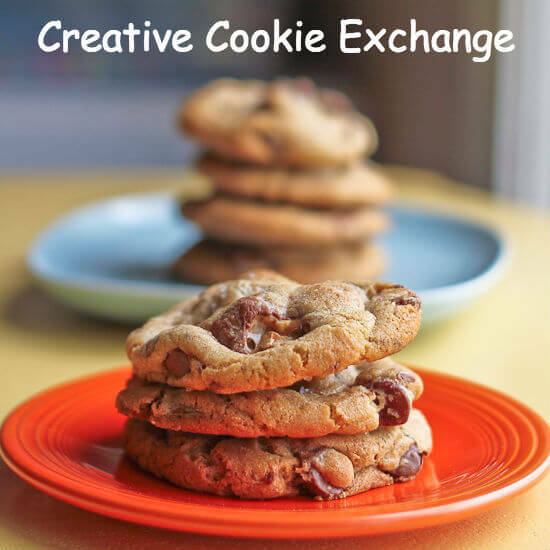 I hope you keep reading to check out all of the other caramelized cookie goodness from Creative Cookie Exchange this month! Very closely adapted from Carole Bloom. Be sure to have everything ready beside your cooktop when you make the caramel, as sugar can burn quickly. 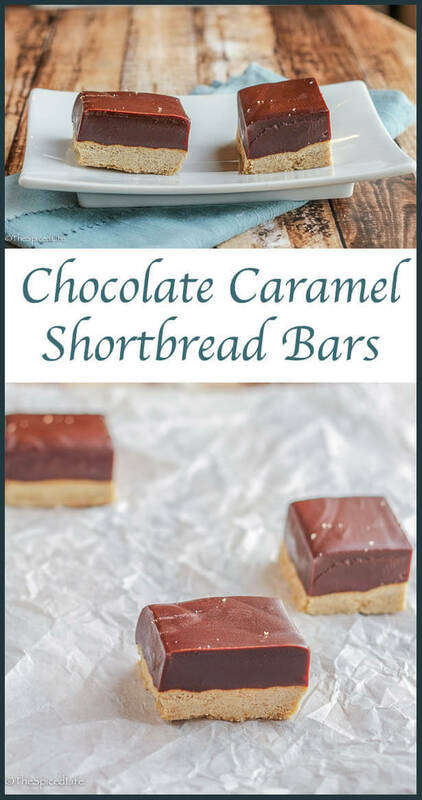 You will want to make the caramel while the shortbread is baking. First make the shortbread base: Preheat the oven to 350 F. Line an 8X8 baking pan (with a minimum of 2 inches high sides) with parchment paper. Set aside. Beat the butter until creamy. Add the brown sugar and beat until fluffy on medium speed, about 1 minute. Scrape the sides and bottom of the bowl as needed. Whisk together the salt and flour. Then slowly mix the flour into the butter mixture--the result will be crumbly, which is ok. Once the moisture in the dough is evenly distributed, dump the dough into the prepared pan. Using damp fingertips, press the dough evenly into the pan. Bake for 25-30 minutes, until the top is evenly golden brown. 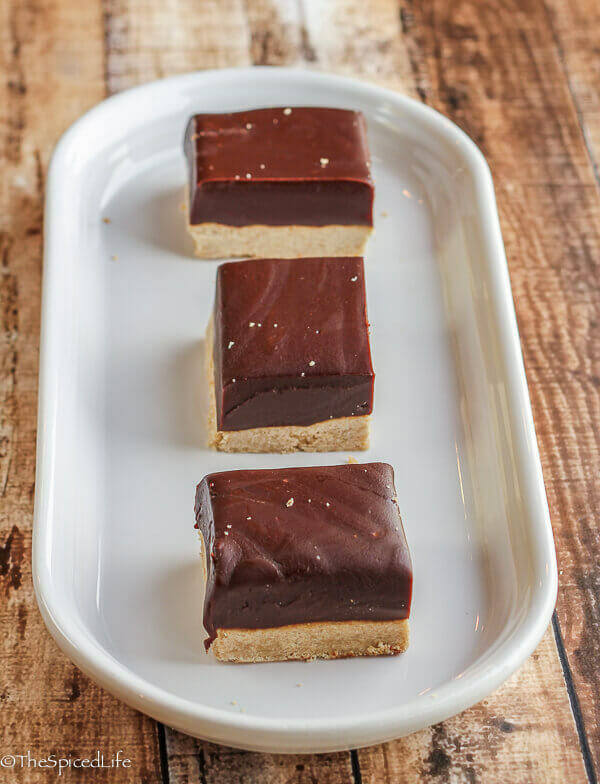 Make the caramel while the shortbread is baking: Place the chopped chocolate in a heat-proof medium-large bowl and set aside. Gently stir the sugar and water in a 3 quart heavy bottomed sauce pan (mix BEFORE placing on heat). Then place the pan over medium high heat. Place a small bowl of water with a heat-proof pastry brush beside your cooktop. When the sugar begins to boil, brush the pan along the edges of sugar/water mixture to dissolve crystals. Turn the heat up to high and repeat the brushing to prevent crystals. Let the sugar boil, without stirring, until it turns amber colored (about 6-8 minutes, 340-345 F). When it turns amber colored, turn off the heat and remove the pan from the heat. Add the butter, cream and salt--be careful as the mixture may bubble up. Immediately begin stirring with a long-handled heat-proof spatula; stir constantly for about 2 minutes, until the caramel is smooth. When the caramel is smooth, pour it over the chocolate. Let stand for 1 minute, and then stir the mixture smooth. Scrape the bottom of the bowl to get all over it combined. Let the chocolate caramel mixture cool for 8 minutes, stirring frequently. Pour the chocolate caramel mixture over the baked shortbread. Then cover tightly with plastic wrap and place in the fridge to chill at least 4 hours or overnight. When the caramel is firm, remove the entire "bar" from the pan by the edges of the parchment. Sprinkle with flaky sea salt. Use a large chef's knife to slice into bars--use an up/down motion, not a sawing motion, to slice the bars. Store in the fridge. The theme this month is Caramel–any kind of caramel in any kind of cookie! If you are a blogger and want to join in the fun, contact Laura at thespicedlife AT gmail DOT com and she will get you added to our Facebook group, where we discuss our cookies and share links. Please be patient though, as this month I am off to Italy and will not be checking email quite as often! These are something I would devour before they even left my kitchen. Forget photographing them, I’d eat the all immediately. If you are over the Atlantic now, hope all is well, enjoy your two weeks over seas. These look fantastic! Have fun on your trip! Oh my. I had to keep scrolling up and down just to look at them over and over. Wow! These look amazing! Have fun! I’m SOOO excited for you!! I’m a worrier also, so I totally get it, but I know you’re going to have so much fun!! Caramel is my favorite of all the dessert flavors…love these bars! We’re having a big 90th birthday party for my grandfather next weekend and he loves sweets. I’m so happy you posted these before the party, because they definitely need to make an appearance! I must add Carole Bloom’s book to my collection– I love all things caramel and your bars are stunning! 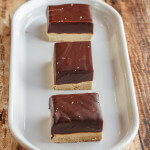 I’ve seen shortbread layered with chocolate then caramel before but I really like this idea of making the chocolate-caramel layer as one. Yum!!! Have a wonderful adventure traveling! Laura those look amazing! Love the sea salt touch. Have SO MUCH FUN on your trip! Your kids will love it! Wow, those look like amazing cookies. I can’t stop starring at them!! That is one thick slab of chocolate and caramel, Laura! I can see why every crumb was vacuumed up! Have a fabulous time on your trip and relish every minute of it. Even the minutes that seem to go wrong. Those will be the best stories when you get back. We have a family policy. If you are going to laugh about it later, you might as well laugh about it now. My hubby has already quoted you back at me because I was laughing about our wretched flight over with only 1 working bathroom right beside me (on a red eye–so EVERYONE used it all night long). Let’s just say in the moment it was hard to laugh lol! The bars look delicious Laura, perfect in shape and size and yes, do enjoy your trip Laura! These bars look fantastic! All that caramel and chocolate would be hard to resist. Hope you have a safe and wonderful trip! Yummy! I think these look so fabulous. I’ll have to try them at the shower I am hosting. Thanks! These look AMAZING! Perfect for a potluck!